Newer versions of WordPress allow multiple websites to share a single Wordpress installation. This means, as a developer or marketer, you only need to install the WordPress CMS once on your server and you can run as many sites as you want off of that one installation. This may sound like a great idea for a big brand or business with various web needs, but there is actually much to consider before installing WordPress Multisite. In this blog we share some of the pros and cons we have discovered with WordPress Multisite as well as some things to consider before installation. The multisite installation is almost exactly the same as the standard installation. If you have experience with WordPress, setting up and managing WordPress Multisite should be very similar, therefore, a short or non existent learning curve. All of your network’s themes and plugins are stored in one place, so no matter how many websites you have set up with WordPress Multisite, you will only have the one set of themes and plugins to take up server space. The superadmin role can control all the plugins and themes which makes rolling updates to all websites in the installation fast and easy. Since each website shares one single database, migration of a website off your network can be very difficult. Though there are some workarounds, there is no true separation of users. This means that each user will have access to the entire network. If one website requires a plugin, you cannot install it on one particular site, it must be installed on the entire network. Also, some WordPress plugins may not work with the WordPress Multisite installation. 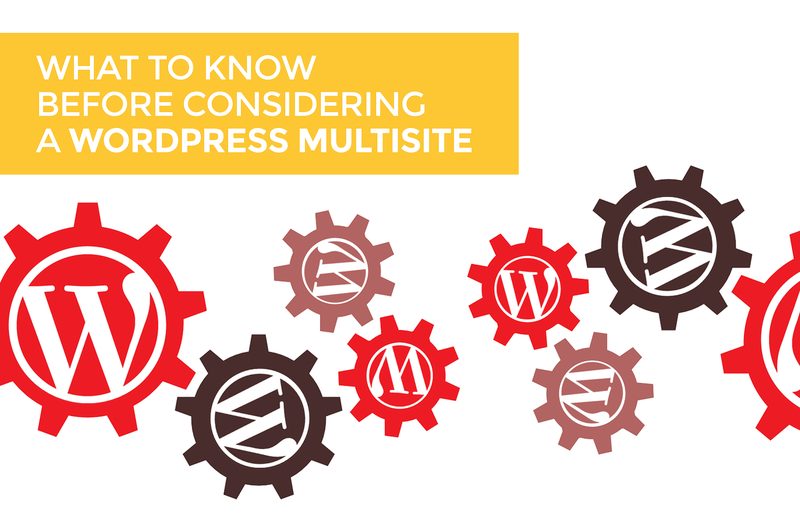 What kinds of businesses should consider using WordPress Multisite setup? In our opinion a WordPress Multisite setup would be great for managing multiple interrelated brands, like a parent brand which child brands. Sometimes, we would even recommend a WordPress Multisite installation for a franchise network. However, it all depends on how the franchise is run. Some franchisees may want their website to be vastly differently than other franchisees’ sites, which may not be the best fit for Multisite. Other businesses that could be a good fit would be one business with multiple stores in different locations or a business that wants a network of subdomains. We’ve seen examples that work well like a university that utilizes Multisite to manage their multiple departments. When is WordPress Multisite installation not a good fit for businesses? How many websites will be in your network? If it’s only a few, then Multisite might not be the best option. Do you want all your sites to look the same? If so, the standard installation can still continue to be a good fit. Do you want to keep users for each site separate? WordPress Multisite is one network, so this won’t work with this installation. Will the sites use different hosts? If you’re looking for different hosting options for the site then WordPress Multisite will not be a viable option. Are you considering a WordPress Multisite installation for your business or brand? Let us help you decide. Contact us using the button below.